Okay. Not an actual pie. Though that would be awesome! But I did learn this very easy but very cool Pie Chart strategy from Nathan McAlister, 2010 Gilder Lehrman Teacher of the Year. It’s a great hook activity that’s awesome for either starting a conversation about a specific topic or as an assessment at the end of learning. Split your class into groups of two or three and give each group a page with a large circle drawn on it. Present three or four possible causes for a specific event. Let’s use the Civil War as an example – slavery, economics, states rights. Ask the group to create a pie chart that divides the causes into percentages. 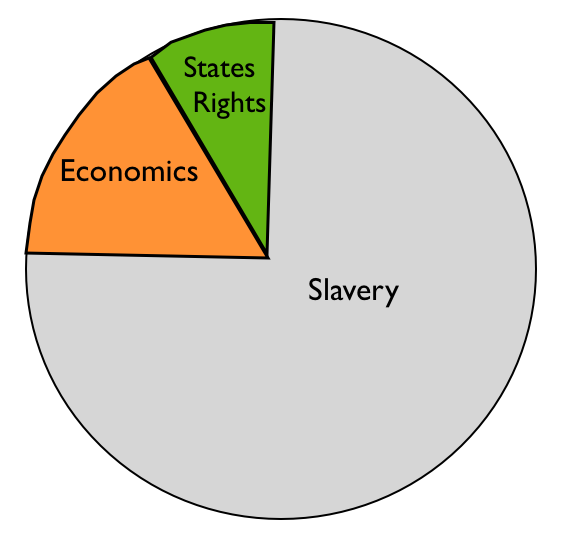 So if they suggest that there was one major cause of the war – slavery – the pie might be 75% slavery, 15% economics, and 10% states rights. Have each group share their chart and explain why it looks the way it looks. The cool thing about the activity is that there are lots of ways to argue and lots of opportunity for conversation. The hook, of course, is that kids will want to know the “answer.” We know that there isn’t a “correct” answer but this gives you the opportunity to present your kids with tons of resources and primary documents to help them solve the problem on their own. The idea is basically the same – kids have to create a Pie Chart that highlights their thinking about a specific event’s causes. The difference is that they have to work alone to create their Pie Chart. Providing written evidence to support their thinking is the most important part of this use of the strategy, this is what you assess. Can they think historically – address a problem with research, develop a solution, and communicate that solution with others using proper evidence? Causes of World War One. World War Two. The Great Depression. Manifest Destiny. European exploration. Rise and fall of different empires. Spread of religions. Inventions.